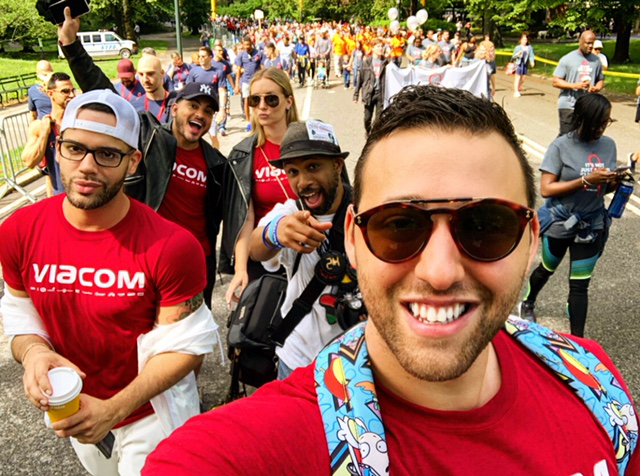 Team Viacom makes its way through New York City’s Central Park during the 2018 AIDS Walk. The team, 50-strong and the driving force behind more than $10,000 in donations to AIDS Walk NY (proceeds will benefit GMHC and dozens of other local HIV/AIDS service organizations), rallied prior to the walk alongside other top corporate sponsors in the so-called “gold section,” a segment reserved for the top fundraising teams, which Viacom has been a part of for several years. After a team photo, we joined thousands of other walkers in the 10-kilometer march through Manhattan’s Central Park. It was nothing short of spectacular. Sporting this year’s red T-shirt, Team Viacom marched, jumped, and cheered together, standing out in a sea of 20,000 other passionate walkers beneath 80-degree sunshine and clear skies. We waved two large Viacom flags as cheerleaders clutching megaphones called out the company name. Volunteers handed out water, granola bars and chips at stations along the route, which was a giant loop through the hills of green and blooming Central Park. With music booming from the sidelines, Team Viacom moved and grooved all the way to the red-and-white-balloon-laden finish line. The efforts were well worth it. Despite groundbreaking new treatments and developments, HIV/AIDS is not a thing of the past. In fact, New York leads the nation in the number of new HIV cases. More than 100,000 New Yorkers have died from AIDS-related causes, while another 108,000 are living with HIV/AIDS – 20 percent of them do not know they are infected. While HIV/AIDS affects people of every background and demographic, it disproportionally strikes certain groups: black females live with an HIV diagnosis at a rate 13.8 times higher than that of white females, while 77 percent of new HIV diagnoses and AIDS-related deaths in New York City were among African-Americans and Hispanics in 2016. This breadth of this impact inspired Team Viacom to rally across brands, employee resource groups, and network talent to gather support for AIDS awareness and prevention. Employees across all New York offices and their families, friends, current and former colleagues were welcome to sign up, donate and walk with the team. To gather the largest group possible, Viacommunity kicked off registration with a city-wide email, took over lobby screens with calls to action, cued up a walking-themed soundtrack to play in the bathrooms of Viacom’s Times Square headquarters, invited AIDS Walk NY representatives in to speak with employees, and filled the lobby-level Refresh Café’s Happy Hour on the Thursday leading up to the walk (complete with a guest appearance from Love & Hip Hop: New York’s Jonathan Fernandez, who walked with the employees on Sunday). The team also placed donation boxes at the Lodge employee cafeteria and Refresh cafe cash registers for employees who wanted to donate spare change. The walk’s success would not have been possible without the dedication of our employees, who take part in Viacommunity events throughout the year. AIDS Walk New York is part of Viacommunity’s “All Good, All Year” initiative, which engages employees each month through meaningful events and ways to give back. The company’s support of the cause and many others goes far beyond fundraising and walking – it is in Viacom’s DNA.